At Hudson Veterinary Clinic, we offer a variety of services to care for your pet. If you have any questions or would like more information on how we can care for your pet, please contact us today. Pet's nutritional needs change as they enter different stages of their lives. The best way to make sure your pet's needs are being met is to consult with us about a diet made specifically for his or her lifestyle. We believe in utilizing the highest level of medical technology, and our surgeons are experienced and highly trained. We also realize that it can be stressful to have your pet undergo surgery. We want to assure you that your pet is in good hands, and that we will do everything to provide the best care possible. We will communicate with you about the things you need to know before, during, and after your pet's surgery. It is our goal to make the entire process go smoothly, and to eliminate the stress and worry of surgical procedures. There are a variety of diseases which affect our pets and other animals. This makes proper vaccination vital in protecting them from the many types of illnesses they are susceptible to. It's important to consult with us about the unique risks of living in our region. We will be happy to discuss the benefits of protecting your pet with vaccinations, as well as, provide you with information on the required vaccinations for your pet. Every year, thousands and thousands of pets go missing. Not knowing where your pet is or how to bring them back can be a helpless, hopeless feeling. It's a tragedy that happens all too often. But there is a simple, safe, and effective way to ensure your pet's safety and retrieval should they ever become lost. Microchipping is a standard procedure that implants a tiny chip underneath your pet's fur. It is a painless and relatively fast procedure, and is completely safe. This microchip is registered with your pet's vital information, and can be scanned by any veterinarian or animal shelter so that they can return your pet directly to you. Regular checkups allow us to establish a baseline in your pet's health and make us aware of any changes that may indicate future problems. We highly recommend bringing your pet in for regular exams. 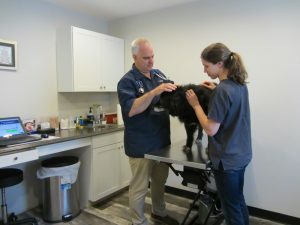 Often times health problems that go undetected can become more serious issues when left untreated, so checkups are important even when your pet appears healthy.